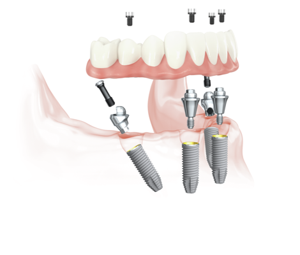 The All-on-4® treatment protocol is an advanced technique that, as the name suggests, allows your dentist to place four supporting dental implants in your jaw and attach an entire arch of new teeth in as little as one appointment. In fact, an entire mouthful of teeth can be replaced in as little as one day! Devised by Professor Paulo Malo in conjunction with the dental implant company, Nobel Biocare, All-on-4® treatment provided by a certified MALO CLINIC partner will help to enhance your quality of life, your smile and, most importantly, your self-confidence. Smile naturally and wholly with a full set of new permanent teeth that look amazing! Want more information about All-on-4®? All-on-4® provides a secure long-lasting full-arch solution for many patients, without the need for bone grafting or drawn-out recovery times. If you’re worried about losing your teeth and facing a life wearing traditional dentures, then you should consider All-on-4® treatment. Downloading Nobel Biocare's handy yet comprehensive All-on-4® patient brochure. Registering to attend our upcoming FREE ALL-on-4® Information Evening. Booking your initial ALL-on-4® consultation. Talk to an experienced Ballarat All-on-4® dentist and find out if All-on-4® could help you.